French politician; born at London 1756; died at Bordeaux Jan. 29, 1816. His parents were members of a Portuguese Marano family, and resided first in Lisbon. During the earthquake which destroyed that city in 1755 his father was killed, but his mother escaped and went to London, where she openly embraced Judaism. A year after the birth of Abraham she removed to Bayonne, and later to Bordeaux, where Furtado was educated. For a short time he followed a mercantile career, but soon turned his attention to the sale of land. His leisure hours be applied to scientific researches. When in 1789 Malesherbes convened a commission of Jews to consider proposals for the improvement of their condition, Furtado and Gradis were called as members from the south of France, Cerf-Berr and Isaac Berr from the north. 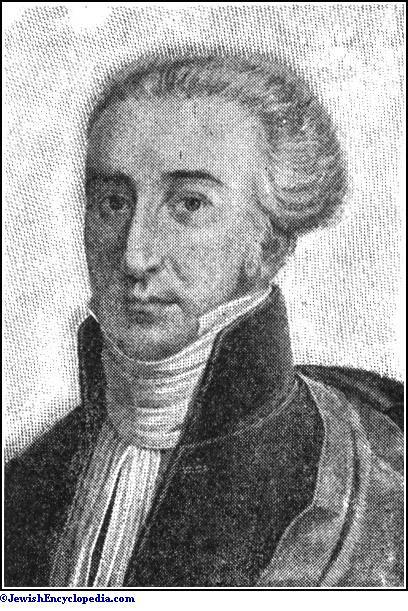 Furtado's friendship with the Girondists caused his exile (1793) and the confiscation of his property. The fall of the terrorists made it possible for him to return to Bordeaux. 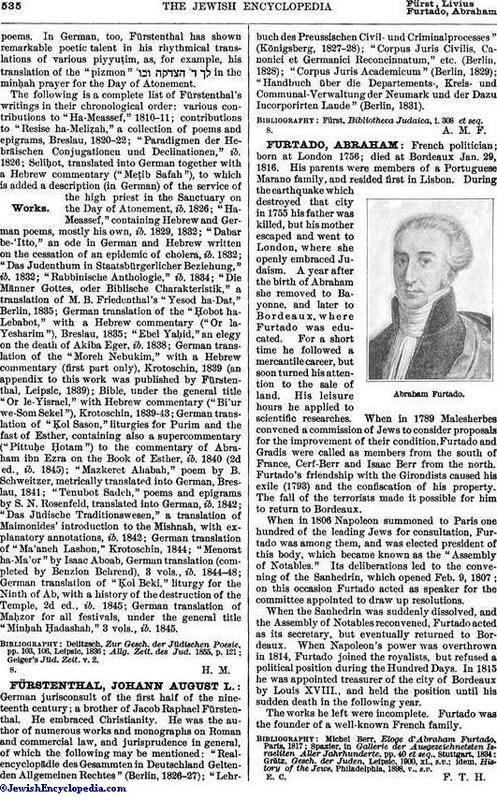 When in 1806 Napoleon summoned to Paris one hundred of the leading Jews for consultation, Furtado was among them, and was elected president of this body, which became known as the "Assembly of Notables." Its deliberations led to the convening of the Sanhedrin, which opened Feb. 9, 1807; on this occasion Furtado acted as speaker for the committee appointed to draw up resolutions. When the Sanhedrin was suddenly dissolved, and the Assembly of Notables reconvened, Furtado acted as its secretary, but eventually returned to Bordeaux. When Napoleon's power was overthrown in 1814, Furtado joined the royalists, but refused a political position during the Hundred Days. In 1815 he was appointed treasurer of the city of Bordeaux by Louis XVIII., and held the position until his sudden death in the following year. The works he left were incomplete. Furtado was the founder of a well-known French family. idem, History of the Jews, Philadelphia, 1898, v., s.v.